At the Filmfare Awards, Surveen was seen in a green gown from Indonesia based label, Anaz. Except for the color, there wasn’t much to rave about the gown. It was as basic as it could be. But, the finishing touches made a lot of difference here. She looked nice. 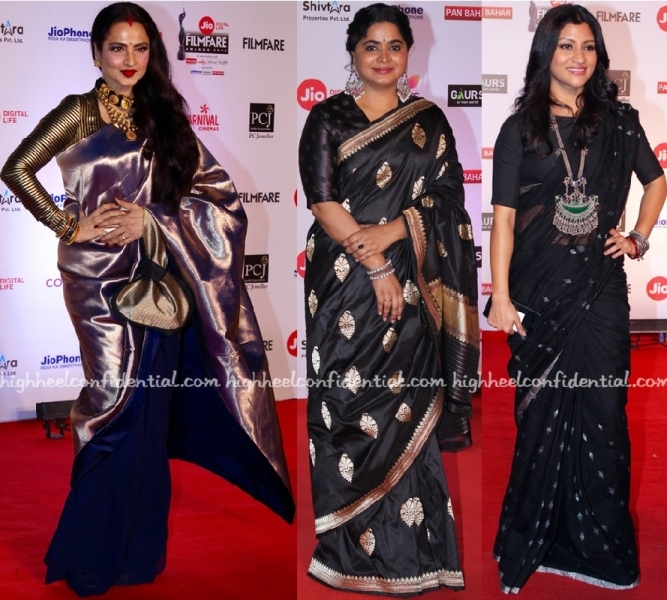 Wearing saris, Rekha, Ashwiny and Konkona attended a recent awards night. As different as their saris were (and the way in which they styled it), the ladies all stuck to their personal style and made it their own. Ashwiny paired her Ohfab sari with Silver Streak jewelry and Konkona teamed her Anavila sari with Amrapali jewelry. Rekha is wearing Manish Malhotra with a bag from Pure Ghee. 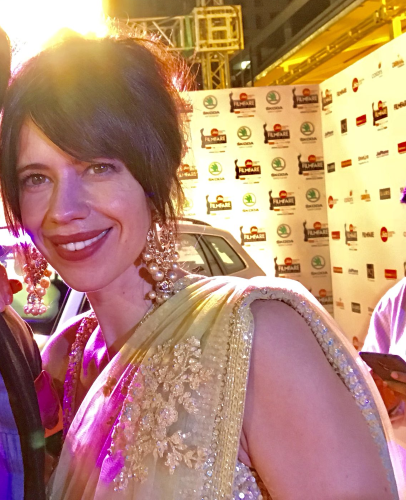 At the Filmfare Awards, Kalki was seen in floral embroidered sheer Sabyasachi sari. I’d say the black Gucci clutch seemed like an odd choice considering how jarring it looked but my bigger issue was with the hairdo. It was just too messy.